News that the #MeToo movement had been named Time magazine’s coveted 2017 Person of the Year confirmed a truly watershed moment in American history: one in which victims of sexual violence—in this case, predominantly women—refused to be shamed or intimidated into silence, while predators would (finally) be held accountable. 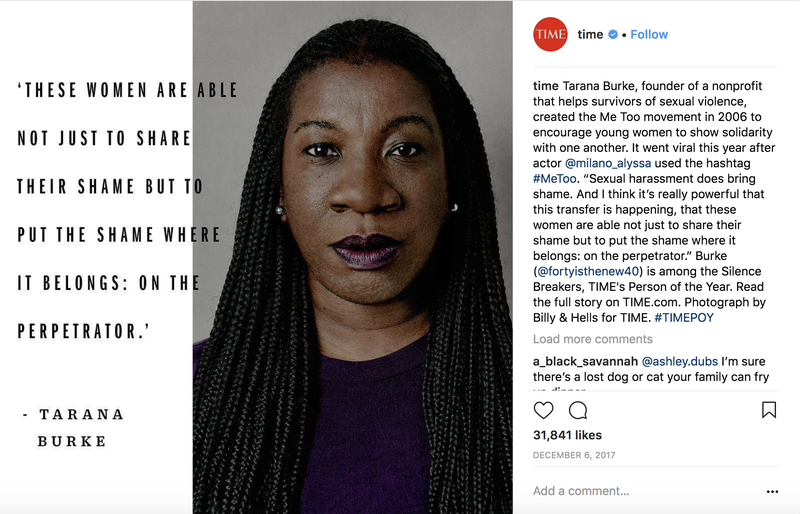 The nonprofit and accompanying campaign, created by social activist and survivor Tarana Burke more than a decade ago, was reinvigorated when long-whispered allegations against entertainment mogul Harvey Weinstein sparked public outrage—bringing #MeToo to the forefront of our collective consciousness. But while it was no surprise that Time rightly considered the #MeToo movement the most influential entity of this year, it was shocking and disappointing to see that its cover layout, which featured five women of varying ethnicities, ages and levels of fame, conspicuously excluded the woman behind it. The phrase was first used more than a decade ago by social activist Tarana Burke as part of her work building solidarity among young survivors of harassment and assault. Actress Alyssa Milano, who inspired the hashtag to go viral after purportedly receiving a screenshot from a friend, used her privilege far more effectively. Milano recognized Burke’s impact and ingenuity in creating this universally relatable—yet, unfortunately, co-optive—expression of empathy. Truly, it has helped give voice to multitudes of previously silent victims around the world. Online, the responses to Time’s cover layout have ranged from anger to begrudging acceptance; marked by the typical bargaining that often punctuates the conversations of black women at the crossroads of intersectionality. [Tarana’s] aware of how upset people are about it, but she’s focusing on what this recognition means for survivors who have felt voiceless, powerless and invisible for years. She’s putting her energy into focusing on what’s next for the #MeToo movement.